Zomi Innkuan Washington in lungdam takin kongmuak uh hi. We are a non-profit, non-political, non-religious organization to help connect all Zomi refugees and immigrants residing in the State of Washington and be apart of other Zomi communities within United States of America. 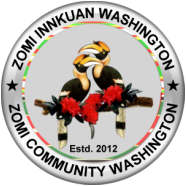 Zomi Community Washington is member of the Zomi Innkuan USA (Zomi Community of USA) and also member of Leitungbup Zomi Innkuan (Zomi Communities Organization around the globe). We are incorporated in the State of Washington (UBI: 603-454-917). Kum 2012 in Zomi Innkuan Washington (ZIWA) ki phuan khia hi. ZIWA kipawlna pen Zomi Innkuan USA, Zomi Innkuan USA Genvai leh Leitungbup Zomi Innkuan tawh ki pawlkhin hi. ZIWA pen Washington State, Secretary of State office pan in zong non-profit organization khat in hong ki ciamteh khin zo hi. Ciaptehna nambat UBI: 603-454-917. ZIWA in Zongeina a tuamtuam te leh i Zolai te a manthan' lohna ding in kepcing ding leh zat siam ding lunggulhna zong a hihi. Hih ZIWA ki pawlna ah biakna, pau le ham ki khen lo hi. ZOMI a it takpi ZOMI te khantohna ding a lunglut te khempeuh hong muak ung.